The international community and shipping firms should intensify patrols along the Somalia coastline to eliminate piracy that is slowly crawling back after a five year lull, a senior UN official has said. Yury Fedotov, the Executive Director of the UN office on Drugs and Crime (UNODC) warned in a statement issued in Nairobi late Wednesday that Somalia waters could become a haven for piracy and other transnational crimes unless vigilance is enhanced. “It is imperative that the international community remains vigilant and commercial shipping follows the advice of navies and international maritime organization when planning safe passage through sea corridors of Somalia,” Fedotov said. Piracy off the coast of Somalia that was at its peak five years ago declined sharply thanks to aggressive onslaught by foreign naval forces and lengthy jail terms for culprits. The criminal enterprise threatened stability and economic growth in Somalia and neighboring countries. Fedotov noted that piracy in Somalia waters undermined global commerce and social cohesion in a region that is yet to recover from devastation caused by civil strife. The UN official sounded alarm over a spate of pirate attacks off the Somalia coast since early March, terming them a drawback to concerted efforts to stabilize the Horn of African State. “The five year let up in serious attacks has led to a collective forgetting about the dangers of Somalia piracy,” said Fedotov, adding that a cutback on navy patrols could undermine war on piracy. Global solidarity in strategic areas like navy patrols, intelligence gathering, efficient prosecution of offenders and economic incentives for jobless youth are key to deal piracy in Somalia waters a fatal blow. Fedotov was optimistic the menace of piracy along the Somalia coastline could be extinguished soon through strategic application of military, economic and diplomatic interventions. He revealed that an international conference will be held in London on May 11 to discuss new strategies that could re-energize the war against piracy in the Somalia coast. 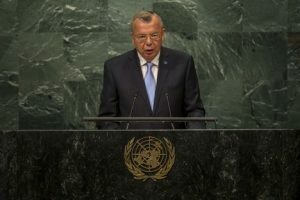 Fedotov said UN Secretary General, Antonio Guterres, British Prime Minister Theresa May and Somalia President Mohamed Abdullahi Mohamed will attend the conference. He added the London conference will inject fresh impetus on existing interventions to eradicate piracy in Somalia.